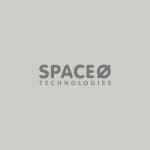 This blog embraces information for tech startups and entrepreneurs. If you want to create a successful shopping app, scroll down to know what is the good news is all about. The lines between online stores and brick-and-mortar stores have been blurred due to the fast-growing online shopping giants like Amazon, Wish, GOAT, eBay & OfferUp. Undeniably, shopping applications have already become the arsenal for entrepreneurs. This is due to the fact that shopping apps are handy. We don’t need to go out of our comfort zone to shop our favorite pair of jeans or any grocery item, which is almost finished in your kitchen cabinet. Meanwhile, we came across this latest news regarding shopping applications. 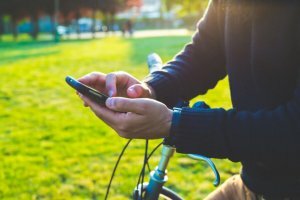 As per the latest data from Sensor Tower, “In shopping apps or eCommerce apps, there is a 16.3% increase in the new app users this Black Friday.” In short, a few top shopping apps like Amazon, Wish, eBay, Fashion Nova, and Shein, have seen growth in the number of app users this Black Friday. 2018: The shopping goliath, Amazon topped the ranking of the most-installed shopping apps. However, Amazon has also achieved this top rank in the previous year i.e. 2018. Nevertheless, Walmart, which is runner-up that posted more significant year-over-year growth. Talking about the largest shopping day i.e. Black Friday, the U.S. consumers spent an estimated $52 million on Apple’s App Store. And, this revenue record has set only in one day. 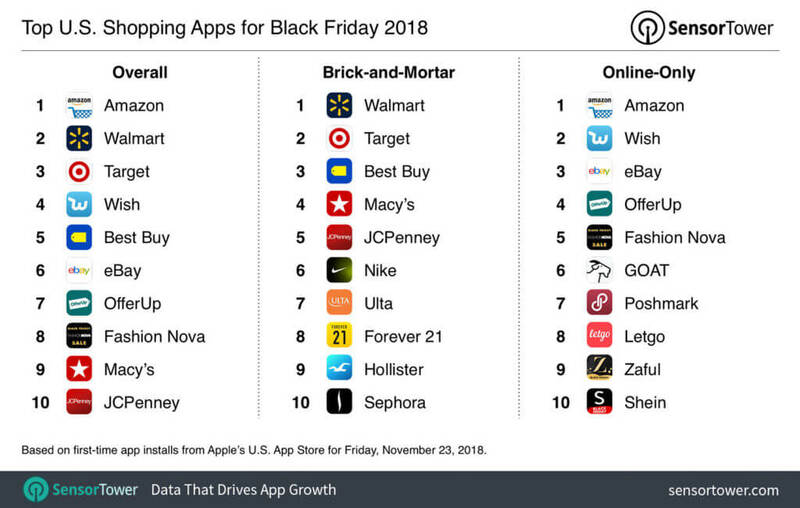 Well, this Black Friday has already embraced a number of growth data for shopping apps. And, after seeing the data, you must be known the fact that the future of shopping apps is bright. 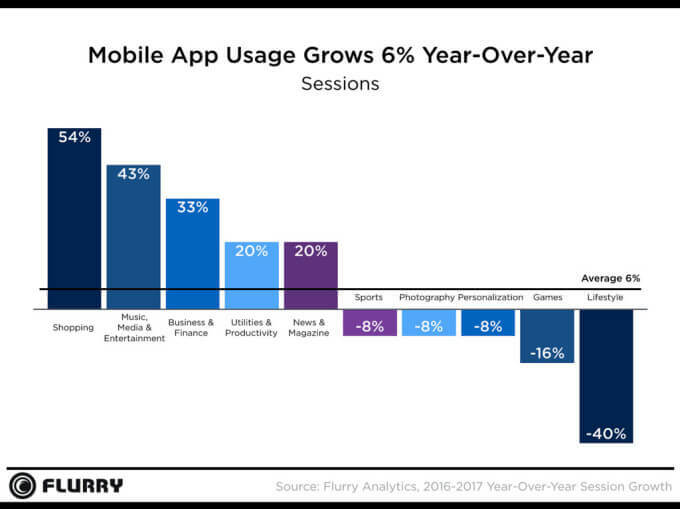 2017: You’ve probably known the data of mobile app usage, which has grown 6% year-over-year in 2017, according to the report from Flurry. Again, not surprisingly, the app category – eCommerce was booming. Long story short, mobile shopping apps have always been booming, especially in the holiday shopping season. 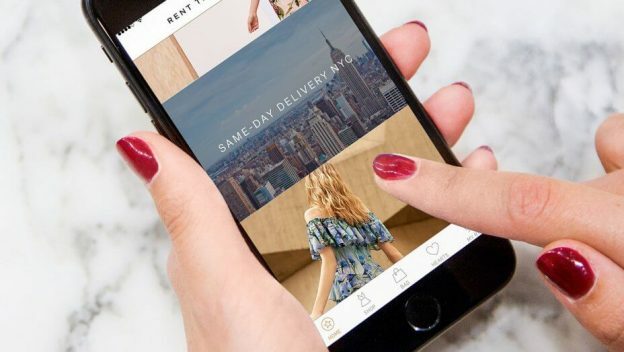 Whether you own a physical store or want to turn a website into an app for shopping, then it all starts with a few core features, which you as a startup can’t miss while developing successful shopping apps like Amazon, Macy’s, and JCPenney. To cater your user’s requirement in a better way, the ‘product search’ feature is all-essential to consider when developing a shopping app. 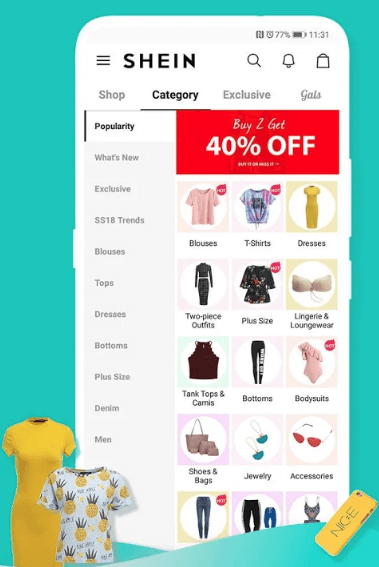 Whether it is about clothing, shoes, accessories or groceries, this feature is core to provide your users with a seamless shopping experience through a mobile app. 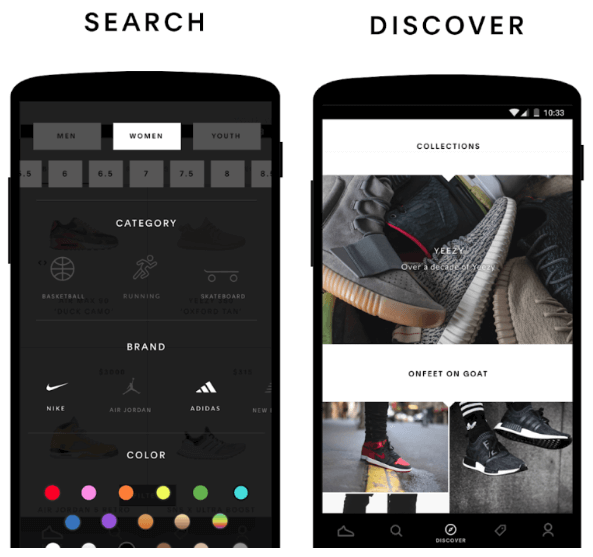 If we’re taking an example of GOAT shopping app, it provides a very neat yet effective product search option. However, it naturally makes things easier while browsing the products from shopping apps like Goat. If you are all ready to create a successful shopping app like GOAT, make sure this feature must be included. To save time of your users, you need to integrate this feature. 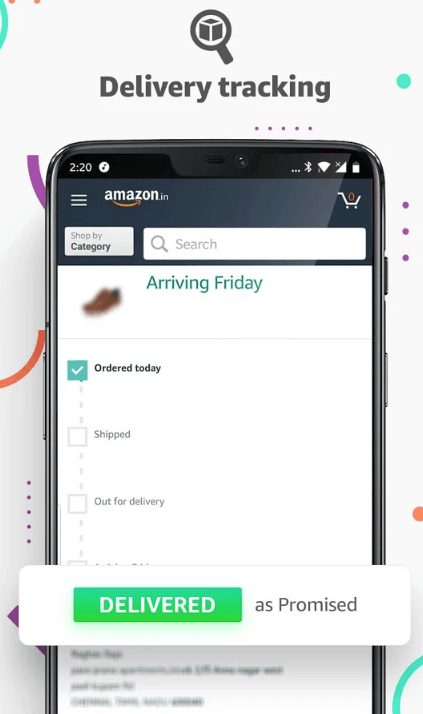 Like all other important features, push notifications is another core feature, which you need to consider By providing this feature, you can make your shopping app more personalized. This core feature has become a powerful tool for every shopping app. This feature ‘Push Notification’ can help you to retain customers for a long time. And it can be used in many ways like discounts, big day deals, and sales notifications. All you just need to take care of the frequency of notifications. Make sure that the frequency of notifications is not high so that people would not understand it and most probably, they could block it. The online shopping apps are meant for providing ease to your app users. Being a startup, you need to be careful while choosing the features of an online shopping app. To make sure that users can easily track their orders without any hassle. 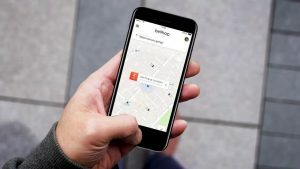 By considering geolocation feature, it makes easier for your users to track their orders in real-time. And, they can also contact to a delivery person if they want to contact them regarding product delivery. At first, this feature looks not much important to consider, but this feature also makes things easier for your app users or customers. By including such feature, users can get in touch with your services if they can easily check their previous orders. And, if your users can access the shopping history, then the chances are high that they would come back to the mobile app again for shopping. One of the effective feature, which can help you to boost sales of your store through an online app is referral codes and coupons. No matter what kind of shopping store or website you own, but if you consider referral codes, coupons, and rewards, it can do wonders for your store. By including this feature, you can provide benefit to your app users and grab the attention of your targeted audience. The main essence of your app is to consider diverse methods of payment to make things convenient for your users. Every mode of payment like Credit Card, Debit Card, Netbanking, PayPal, COD, or any other secured payment modes. All top of it, secure payment is all essential to consider while developing a successful shopping app. Furthermore, the shopping cart is the essential feature, which can grab instant attention of your user. So, you need to provide fast and easy check-out to your customers when they want to end up their shopping. A must-have feature is an online support, and without considering this feature, your shopping app can’t be completed. So, online support feature provides another way of convenience to your users. With this, they can easily ask for help or query if they are having. In-app chat or online support can help your customers. And, the chances are they will remain stick to your shopping app. This is due to that fact that it provides a seamless shopping experience if they encounter any problem while shopping through the app. You have just gone through with the demand for shopping apps have been growing for the last few years. Plus, shopping apps are high in demand, especially in the holiday seasons. However, being a startup, if you are ready to dive into this sector, you need to leverage on these common features in order to make most out of your online shopping application. If you want to become a profitable startup for your eCommerce businesses, and having a shopping app idea, which gives your business a spontaneous growth, then cross-verify it with us as we’re a leading mobile apps development company. 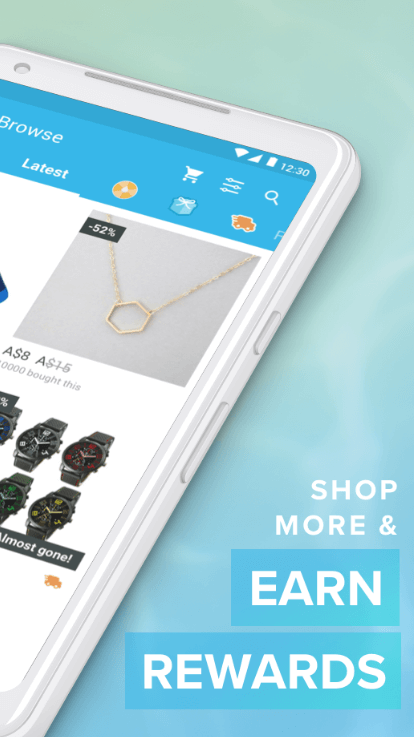 And, we’ve already developed over 50 shopping apps along with unique features and functionalities like real-time tracking, payment gateway integration, online support, multilingual support, and cross-platform ability. 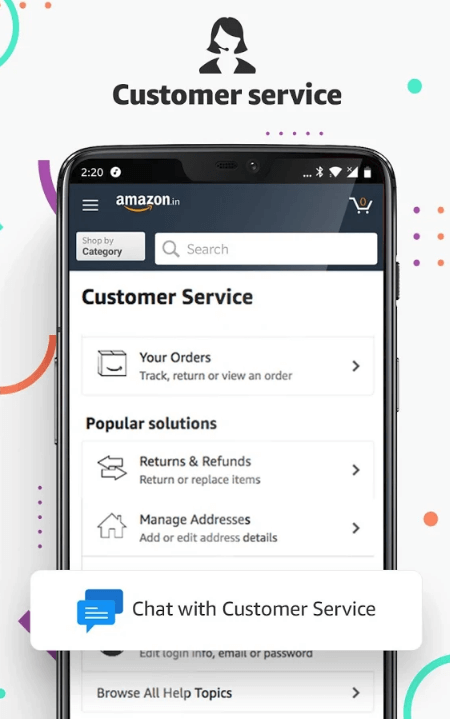 In case, if you still have any query or confusion regarding the development cost breakdown of apps for shopping or what’s the importance of considering an MVP (Minimum Viable Product) of online shopping apps or eCommerce apps development, Amazon-like app development or how to make money with an app idea, then you can get in touch with us through our contact us form. One of our sales representatives will revert to you as soon as possible. The consultation is absolutely free of cost. This page was last edited on March 13th, 2019, at 8:53.